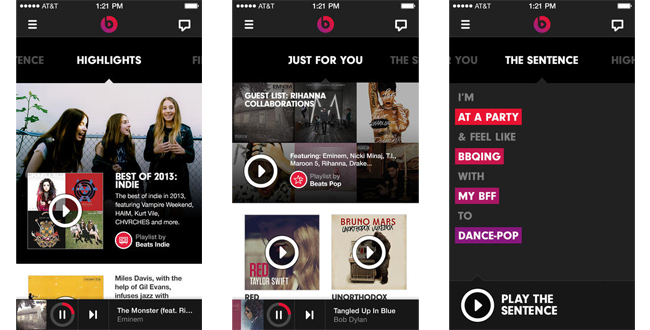 Apple Updates Beats Music App. by Mark — in In The News....Leave a Comment on Apple Updates Beats Music App. The beats music iOS app has just received a fairly sizeable update for the average user. The company has added a tune your taste function this lets people change their favorite genres and artists under the apps settings menu users also now have access to a sentence history. Sentence lets people do a sort of mad Lib to let the music play filling in the sentence I’m blank and feel like blank with blank to blank with multiple choices to fill in the blanks. Apparently the new feature lets one go back and relive the magic of a particular mad Lib somewhat for the average user and somewhat for the upper crust the 2.2.0 version of the app also adds verified badges. The Beats Music app is free that the service is not it starts with a 14 day free trial two subscriptions are available after that by in app purchase. Either $9.99 a month or $99.99 a year for unlimited access to the service. Previous Previous post: Swell, A Pandora Type App For Podcasts Rumoured for Apple Buy Out. Next Next post: Apple TV Adds Fox Now, CNBC Channel. Slowly moving towards the iTV?